Welcome to the Crafty Secrets November Linky Party. This month, we are celebrating Christmas and winter inspired projects. Each design team member has prepare a tutorial to inspire you. Today, I am sharing how to create a digital card element by combining images. Create a new file to begin your project. Next open the files to be used. Using the Move Tool, drag and drop onto the new file created. 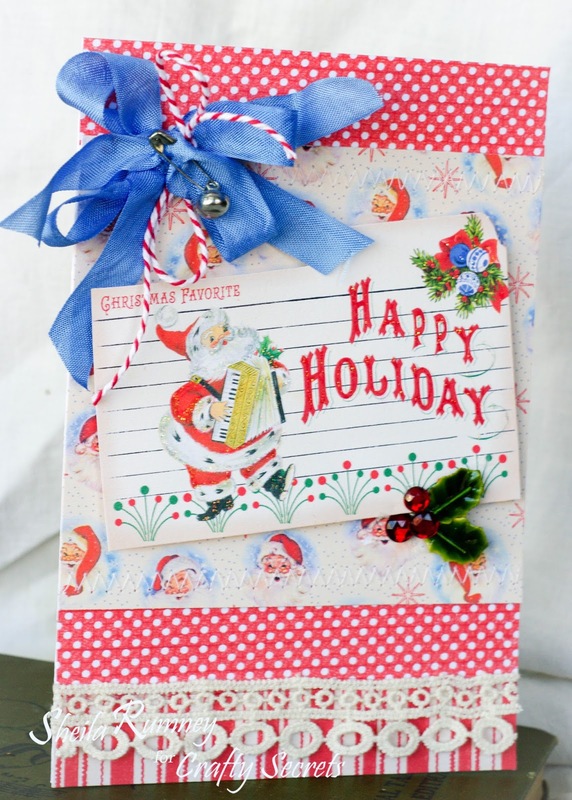 I layered the with the Santa and Happy Holiday Images on top of he Christmas Favorite Recipe Card. Save your artwork and print. Print the additional papers to use with your artwork. Then add yummy ribbon, lace and embellishments to complete. This is so perfectly retro, Sheila! I love the colors and images and that pop of blue bow is perfect! LOVE THIS!!! 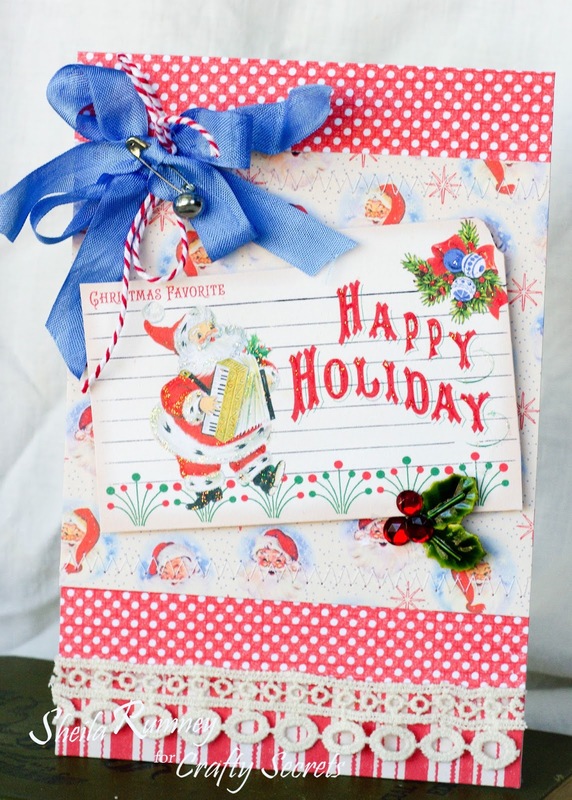 The design and colors are magnificent and how adorable is that ribbon/jingle bell treatment! WELL DONE once again and of course thanks for your wonderful way of teaching us more about doing digital creations. You are so clever!! Hugs! One of the things I always love about your creations is that the colour match is always spot on and as it always matches I know this is no accident. I love how the blue bow picks up the blue of the ornament and the pin with the bell is so cute. The reds are also a perfect match. This is such a cute retro card Sheila, I love it. Thanks also for the step by step tutorial. I'm still new to digital. Super cute retro Christmas card Sheila. Love the Santa you added to the recipe card with the paper and stitching you did. 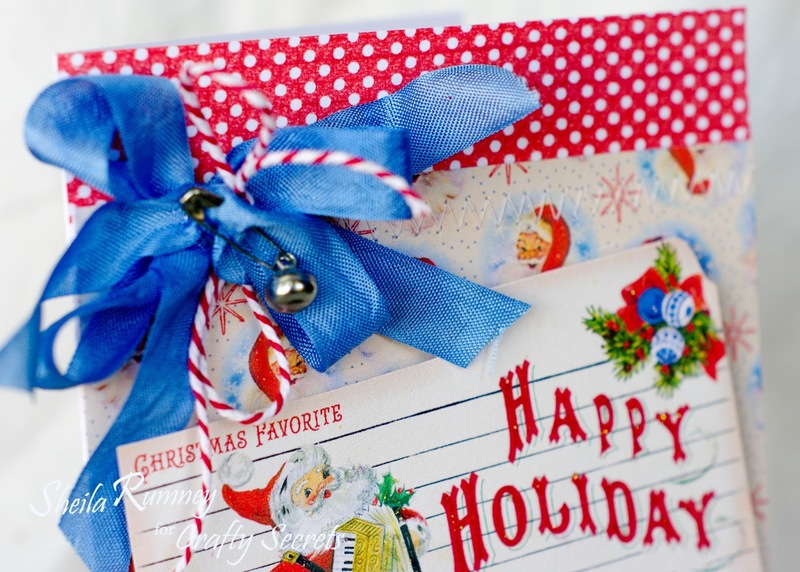 Love, love this beautiful card...the colors are fabulous and a wonderful tutorial, too!! Retro Christmas is going to be huge this season, and girl you totally convinced me to jump on that retro Santa bandwagon! swoon!!! So cute and retro! I love how you added the text!